Oyster recipes range from the simple to the simply delicious. The hardest part is usually getting the oyster open. 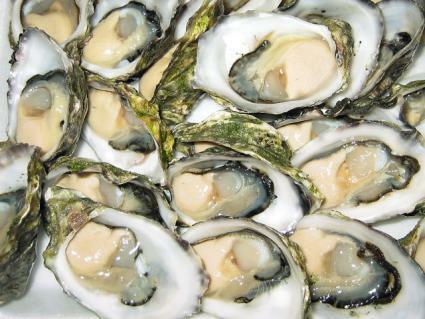 It has been said that oysters are a natural aphrodisiac, although this has been said of a lot of foods including pomegranates, avocados, tomatoes, chocolate, and mangos. Since most of the foods just listed were not known at the time that Aphrodite was worshiped (I was going to say popular, but she is fabulous and will always be popular), I would say that if she were to give her seal of approval on any food it would be oysters. They are slightly sweet sometimes, definitely salty, and best enjoyed by holding the oyster briefly in your mouth and then swallowing quickly and enjoying the salty, briny aftertaste. For the uninitiated, the texture and consistency of oysters can, at first, be a bit off-putting. With some practice, slurping the oyster into your mouth and swallowing while savoring the taste becomes a pleasure that you will want to experience as often as possible. Oysters are wonderful and deserve a place in any romantic dinner setting. Most oyster recipes will ask you to open the oyster. The most effective way to get an oyster opened is to use an oyster knife. If you do not have an oyster knife handy, a good sturdy butter knife will do in a pinch, but if you are going to be opening more than a dozen or so oysters you may want to look into getting an oyster knife. Oyster knives are rather stubby looking tools with a thick relatively blunt blade. Sometimes the tips will be bent slightly to facilitate prying open the shells of the oyster. If you happen to have a cut-proof glove around, I would suggest wearing it because the shells will sometimes fragment and can get quite sharp. If you don't have a glove, a couple of kitchen towels will do the job just fine. Fold one towel 2-3 times to create a base and place your oyster on the towel. You will notice that one part of the shell is more rounded than the other. Place the rounded shell down on the towel. The pointed end of the oyster is where you will be prying the shells apart. Place another towel over the part of the oyster that is not pointed and hold the oyster down at this part. Slide the point of your oyster knife into the joint where the two shells meet and firmly pry up the top shell. Once the oyster is opened, use your knife to loosen it from the shell. At this point, I would squeeze a drop or two of lemon juice onto the oyster, a dash of Tabasco, and eat it. Most oyster shooter recipes will tell you to use cocktail sauce. I personally believe that cocktail sauce should be called "the red menace." It has such an overpowering flavor that it overwhelms whatever you are putting it on. Oysters have a delicate flavor that we want to enhance rather than wash out. But, if you are so inclined to use cocktail sauce, please feel free to do so. I would ask you to try the following recipe first. Put one oyster and it's liquor into each glass. Then add one ounce of vodka per glass. A dash each of the Worcestershire sauce and Tabasco sauce. A quick grind of pepper. The original recipe for oysters Rockefeller was created in New Orleans at the restaurant Antoine's. They guard the recipe so well that the best anyone can do is get close to their taste. Pernod is an anise flavored liquor. You can probably find it at your local supermarket and definitely find it at the liquor store. Place your broiler rack to the middle position. Place the parsley, cilantro, green onions, tarragon, and chervil in a food processor. Add the breadcrumbs and pulse until it is well incorporated. Add the butter and pulse until incorporated. Add the Pernod and taste for salt and pepper. Add a few dashes of Tabasco sauce. Taste again for flavor. Spread the rock salt evenly in a sheet pan or a cookie sheet. Spray the salt lightly with water. Set each oyster in the salt so it is level. Make sure there is some liquor in each shell. Top each oyster with a tablespoon of the mixture. Broil for about five minutes or until the mixture is bubbling.